We believe in something better. MHB Real Estate is here to improve this dynamic for our clients, our agents, and our industry. That's why we believe we're the best real estate company in Dane County. We've made selling a home better. As “The Evolution of Real Estate” we noticed the world around us is constantly changing, yet the traditional realtor approach is stuck in a past generation. By utilizing better processes, new technology, and a team approach, we are more efficient. We paired this efficiency with experienced advice, powerful marketing, timely customer service, and proven practices. As a result, our listings sell for great prices and they sell quickly. Combined with a one rate fee of $3,000, our seller clients net as much as possible from the sale of their home. Happy clients with more money in their pockets is the evolution real estate has been waiting for. To be the best, we've hired the best. Instead of recruiting a large number of independent contractors as our agents, we hire the best and the brightest to represent our company and our clients. 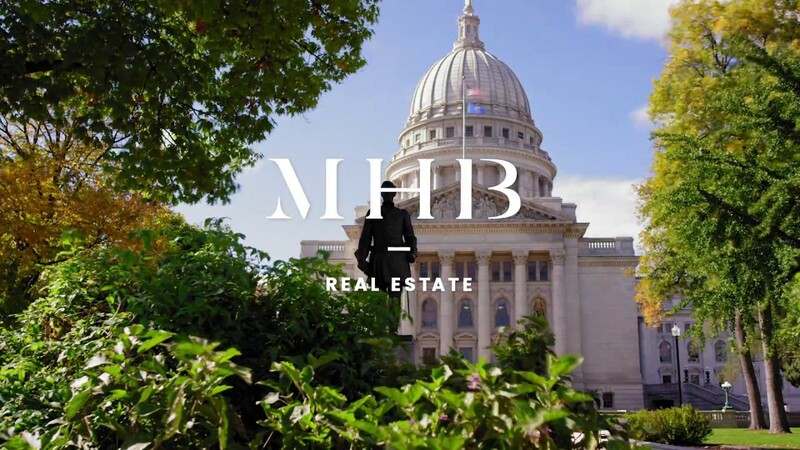 Our agents are employees of MHB Real Estate. They receive benefits, their expenses are paid, and they are backed by support staff to make them most efficient. On an annual basis, our agents experience more than double the average number of annual transactions and they earn more than double the average Realtor. We considered all the smallest details, built a top notch team, and implemented a proven process to deliver the most satisfying and effective real estate experience. Then we priced our service to present the strongest value proposition imaginable. Dan's excitement for real estate is only matched by his admiration of MHB orange - which he strategically incorporates into his daily wardrobe. With Dan, "excitement" may be an understatement when it comes to new ideas. It’s like Christmas morning for Dan each time he shares his latest and greatest idea. Dan is one of the “good guys” - this shines through in both the way he conducts business and in every client transaction he leads. Dan exudes a calm and collected attitude, which compliments his unmatched negotiating skills perfectly. Like a bad cold or a catchy tune, Dan’s demeanor is contagious amongst the Team at MHB - they love him for this, most days anyway. Dan enjoys living an active, “whole food, plant based” lifestyle, balanced with just the right amount of Bourbon Whiskey. After a regular family outing to Willy Street Co-Op, Dan is most happy at home with his wife Kristen and uber adorable sons - Little Man (Elijah) and Mr Eyes (Isaac). The Tenney’s also enjoy a running, biking and time outdoors with “the boys” Barry & Eddie - their labrador sons. When not at home or with family, Dan's frequently in a sand trap or searching for his ball at Nakoma Golf Club. We're not sure if Chris sleeps or even sets his iPhone down for that matter; his clients love him for this. Chris seeks out and retains information like an owl from a storybook, which comes in handy for real estate. In his pre-MHB days, Chris pursued his professional baseball aspirations, while "studying" at UW-La Crosse. He's a smart dude, he even has a bachelor’s degree in Finance/Economics to prove it. Chris enjoys long walks on our local sidewalks with his wife Brooke and dog Jack. We've found that providing Chris with a beer and a seat at a local establishment, such as Wisconsin Brewing, is probably the best way to make him temporarily set aside his drive for real estate. He's also one of those "sports guys". If you mention anything that's been on ESPN recently (or perhaps ever) Chris can talk details. Erica's immaculately clean, color coordinated, and perfectly organized desk is synonymous with the type of real estate service she provides. The timely, concise, and thorough communication provided by Erica often leaves her clients with their questions answered before they have a chance to ask. Before falling in love with MHB, Erica made the world of commercial real estate a better place. Prior to that, Erica's fellow students at Madison College loved having her around. We all remember that lifesaving friend who was first to class and always had their homework done, right? Thanks Erica! As much as Erica would like to take credit, it's well-known that her husband, Justin, is responsible for the naming of their adorable "fur-babies" Iceman, Cougar, and Maverick. As fun as those names are, hanging out with Erica and Justin is a blast, even if she insists on listening to 80's music. It's no wonder they are most often surrounded by friends and family, while traveling, grabbing a bite to eat, or enjoying the great outdoors. There’s no such thing as “Breaking News” with Kaitlin around - she found out two days ago. Example: Kaitlin knew she was going to work at MHB before MHB did, no joke. Her thirst for knowledge, relentless pursuit of answers, and elephant-like memory make her a valuable asset in when it’s time to buy and/or sell one of your most valuable assets. You won’t be surprised to know she graduated from Edgewood College with a degree in Communications to suit the previously mentioned personal strengths. Kaitlin's husband Jake will tell you, “I fell in love watching her throw perfect spirals in 4-inch heels”. Aside from the spirals, Kaitlin also hits the gym about as often as Aaron Rodgers. As a connoisseur of all things Wisconsin - Badgers, Packers, and the foodie scene that coincides, Kaitlin sees dedication to health and fitness as an essential. Whether she's breaking bread, hanging out, or traveling, Kaitlin surrounds herself with friends, family, and good conversation. David is a lifelong Madison resident that has worked in the financial and banking industry for over 10 years. His dedication, drive, and compassion for his clients provide for a smooth and hassle free experience. David is an avid outdoorsman and when he's not on the boat he is probably golfing David is very active in the community and participates in many local chambers. He's out of the pool and into the real estate market. Michael applies the same level of dedication and drive to real estate as he did his career as a professional swimmer. In his years as a Badger athlete, Michael was also an Academic All-American. They say, "Win the morning, win the day". With Michael, the 5am swim sessions are now 5am business sessions. Michael's clients can count on him to be one stroke ahead of the market and his Realtor competition. When his home showings are done for the day, Michael's ideal plans would consist of a hike, fun in any type of water, and relaxing with a glass of wine afterward - unless there's a Badger Football game of course. Kristin is actively making sure she lives up to her potential in every way possible. We're pretty sure she completed 72 straight hours of "realtor education" classes over a lunch hour. She has trouble keeping a to-do list, mostly because it's all done. Kristin combines execution with a compassionate understanding of her clients wants, needs, hopes, and dreams to deliver an outstanding experience for anyone who's looking to buy or sell a home. Also related to Kristin's ability to warp time with her own time-space continuum type productivity model, once she's successfully completed 10-12 hours work in an 8 hour workday, it's usually off to the gym, grocery store, and then daycare to pick up the kids. Kristin and her uber-talented masonry contractor husband Jeff enjoy their downtime with family, including two kids - Mason and Eden, and two feline adoptees. Kara claims to have joined MHB after a successful start to her career at another local startup, but we're pretty sure she may have really been part of a high level, top secret, special black-ops unit, code-named "Operation Get-it-done." She does just that, gets it done, with tactical precision, for MHB's clients with prompt communication, attention to detail, and an unparalleled drive to improve every aspect of her day-to-day work. MHB's agents and clients alike are lucky to be on the front-lines of real estate next to Kara. When Kara's not at MHB, filling the air with the aroma of her apple cider vinegar tea concoctions, she's likely taking on another type of personal improvement or competitive pursuit. Whether socializing with friends, competing on a volleyball court, or grabbing a foodie-like bite to eat, Kara enhances her surroundings in a way that's beneficial to all. Before starting at MHB, Sam could be found flying around the world as a stewardess, assisting passengers in the sky. Her love of travel and helping people was met with an equal passion for discovering new cultures and how they live. Sam’s love of family and midwestern living brought her back to her home state of Wisconsin. Now that she is grounded, she helps her clients with the same elegance and amenity. Her dedication to service is all the more obvious when you witness her ability to assess a client’s needs. Sam was a competitive water skier at UW-La Crosse, where she also completed her undergrad. To this day, she still has a hard time staying off of skis, whether it’s on water or snow. She is also an avid explorer who loves to see new places and try new things! Sam is a major animal lover, and enjoys spending down time with her fur-baby, Monty, or volunteering at Heartland Animal Sanctuary.